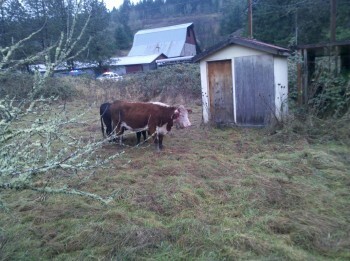 It all started with a phone call from Jon; some cattle were loose and running around on hwy 47 near Gaston Oregon. This is never a good thing! Jon said he was headed that way with a stock trailer so I asked him if he needed me to bring my dogs and horse and he said sure. I loaded up my Quarter Horse Badger and 3 dogs, Tyson and two of my Hangin’ Tree Cow Dogs. When I showed up in Gaston, there were a few Yamhill County and Oregon State police officers milling about. I was told by the officers that there were 3 head of cattle down in the brush at the edge of the field and they couldn’t do anything with them. About that time, Jon called me from down in the field because he was trying to keep them from going out into a larger field. He asked what I wanted to do just as I was asking him what he wanted to do! I suggested that we have the road blocked my ODOT who had actually shown up by then. I told the police officers that I would go down to the field with Tyson and see if he could control the cattle, then we would bring them up to the road and load them into Jon’s trailer because we couldn’t get the trailer into the field. I took Tyson and my horse into the field to see what we could do. The first thing that happened was the cattle brushed up. I was close enough to see what was about to happen and told Tyson to go bring them and the fight was on. One cow decided to kill Tyson or at least run him off. They fought it out for awhile then the cow and one calf came out of the brush and into the road. I just stayed down in the field on my horse where I could keep an eye on the other big calf. I thought I might have to rope them and tie them to trees. But I kept waiting and telling Tyson to bring them back. I could see some of the fight going on with Tyson and could hear the cow bawling. After a few minutes the cow and calf came back down into the field. I got Tyson to bring them back to the other calf. By then Jon was backing his truck up to where the cattle had come out onto the highway. He set up a couple of panels and I had Tyson help me head them to the road. Once we got to the road, the cow kept trying to get around the panels and into the berry bushes. I threw a loop on the cow and drug her back to the field and had Tyson bring the calves and hold them till Jon got a couple more panels set up. Tyson and I got the cattle back to the road where the cow started into the trailer but then stopped. Luckily Tyson bites when I tell him so he bit the cow and she jumped into the trailer with the other two calves following her. We shut the trailer gate and it was over! I have learned over the years that when people don’t know about me, my dogs and the services I offer they can end up chasing their cattle for days, sometimes weeks, until their only option left is to call the slaughter truck out and have their cattle shot. Then they have to find buyers, move the bodies, store the meat and so on. It’s a lot better to just contact me at devpcd.piercescowdogs.com. I’ll come out with my horse and dogs, catch the cattle for you (usually within a day) and with a lot less headache – guaranteed! Secure gates and good dogs! Tokecia on Good Pet and Working Dog Too! Marvin Pierce on Welcome to the New Pierce’s Cow Dog Site! Karen on Welcome to the New Pierce’s Cow Dog Site!